It took six years for Peter Gabriel to release a proper followup to So. Us lacked the exuberance of his last pop album, as it was less a coming-out party than a looking-inward analysis of Gabriel’s post-popstar period. The advance single, “Digging In The Dirt,” was an amalgam of pop music, polyrhythms and Passion. It was wonderfully rich, the sort of song you could go digging into each time and unearth some new sound that you hadn’t heard before, and you could dance to it, albeit awkwardly. The single was actually a bit of a tease, as it featured an understated reworking of “Steam,” appropriately re-titled “Quiet Steam,” that certainly gave fans of So reason to pause. “Quiet Steam” was a walking back of the confident leap forward of So, but it’s really something of a red herring, as the rest of Us wasn’t so fragile. The maxi-single included one or two extra tracks (depending on where you lived): an instrumental version of “Digging In The Dirt” and a new track, “Bashi-Bazouk.” The instrumental version is a hoot, and is more of a remix than anything else, while ‘Bashi-Bazouk” is an ambient piece that sounds like a continuation of the Passion adventure. Both are worth hearing, particularly given the profound absence of new Peter Gabriel music in the world. 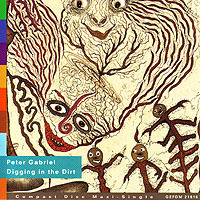 “Digging in the Dirt” was again accompanied by a groundbreaking video that won a Grammy Award for Best Short-Form Video in 1993, which finds Peter picking at old wounds rather than poking fun at himself. “Digging in the Dirt” and “Bashi-Bazouk” produced by Daniel Lanois and Peter Gabriel, “Quiet Steam” produced by Peter Gabriel and Dave Bottrill (B1); engineered by Dave Bottrill; frameman mix on “Digging in the Dirt (instrumental)” by Dave Bottrill; “Bashi-Bazouk” remixed by Richard Blair. Package by Malcolm Garrett/Assorted Images. Painting by Zush. Released on 7-inch, CD, cassette and 12-inch single on September 7, 1992 in the US and Canada (Geffen, 19136/GEFCS 19136/GEFDM 21816), the UK and Australia (Virgin, PGS/PGSDG/PGSC 7/PDG 712) and Japan (Virgin, VJCP-12001); reached #52 on the US charts and #24 on the UK charts. Also released as two-track 3-inch CD single on September 16, 1992 in Japan (Virgin, VJDP-10196) [same tracks as 7-inch single]. Also released as promotional 12-inch and CD snigle in 1992 in the US (Geffen).